The Octagon follows up last year’s brilliantly atmospheric retelling of The Tenant of Wildfell Hall with another visit to Bronte country. The challenge this time is to find fresh things to say with Charlotte Bronte’s far more familiar and frequently adapted tale of thwarted love. Director Elizabeth Newman and designer Amanda Stoodley respond by ramping up the psychological horror in Jane’s childhood and adding an extra level of clattering physical discomfort by placing the action within a metal cage. The young Jane’s banishment to the red room is now a nightmarishly realised ordeal, while the manic laughter and skittering movements of the first Mrs Rochester high up in the rafters creates a deeply unsettling effect. 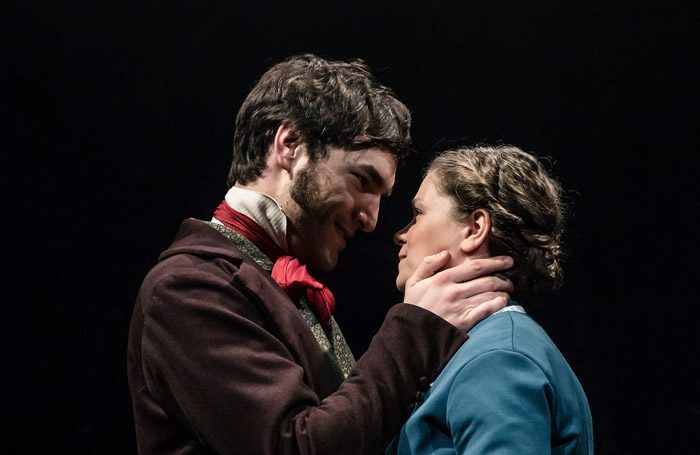 The trouble is Janys Chambers and Lorna French’s adaptation – artfully filleting Bronte’s 400-page tome – is more conventional, and the enjoyably breezy, romcom-ish tone of some sections is slightly at odds with the production’s more harrowing moments. Possibly because of overfamiliarity, the story’s big reveal and the final reunion don’t quite have the impact they need to reward the audience – or Jane – for enduring the earlier hardships. But this is through no fault of the cast, who give it their all. The younger ensemble members acquit themselves brilliantly with some challenging material, with Jasmine De Goede in particular playing the young Jane with remarkable assurance. Jessica Baglow is also perfectly cast as Bronte’s adult heroine, utterly believable as a proto-feminist starved of love in her early years but determined to make up for it later in life.